Ushuaia ("ush WHY a") started its existence over a century ago as the “Siberia” of Argentina and some of its older buildings, as well as estancias, were built by prisoners. The infamous jail was closed in 1947 and is now a maritime museum and headquarters for the naval presence in the Province. Just 35 years ago Ushuaia remained a sleepy backwater with a population of 7,000. The town traditionally provided services for the vast sheep estancias of Isla Grande, Tierra del Fuego’s main island, and for ships making the passage around Cape Horn, less than 50 miles south. 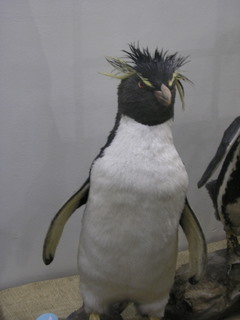 The population was (is) largely non Spanish-Argentine. The region’s early settlers, English, German and Croatian, established most of the estancias and settlements. Spanish-speakers arrived as a natural extension of Argentine and Chilean nationalist expansion southward, after independence and civil wars in the latter part of the 19th century. “Nationality” for the residents was not as important as both economic and family regionalism. But territorial disputes between the central governments in Santiago and Buenos Aires had waged for decades and intensified during the military dictatorships in both nations in the 1970’s and early 1980’s. As the economic prosperity of the estancias declined with the decrease in sheep ranching profitability, the real threat of a population exodus - in all the archipelago - compounded the territorial dispute. Both governments enacted economic incentives to bolster the population, declaring duty free zones to encourage the establishment of industry and suspended certain taxes for residents and visitors. The downfall of the dictatorships, and Papal intervention in 1985, prevented all-out war. Both nations accepted United Nation's and Papal mediation that established definitive boundaries. With peace and natural beauty, tourism boomed. 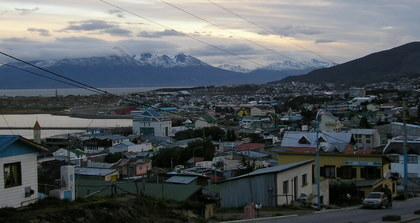 Today Ushuaia has over 39,000 residents. 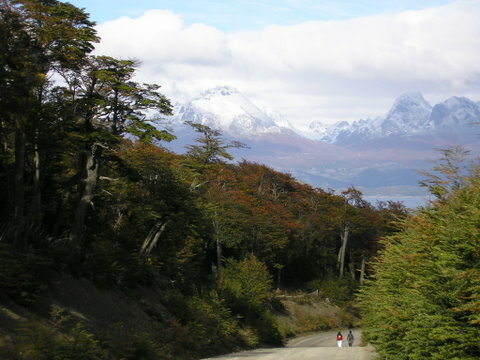 In Chile, Punta Arenas and Puerto Natales have experienced substantial growth. Many estancias have transformed into luxury tourist accommodations with diminished, but still active, sheep and cattle stocks - including the provinces only certified Angus herd. Ushuaia’s stretches along a narrow, flat strip of land on the Beagle Channel, but the town quickly rises up the side of the mountain in a jumbled mass of buildings with little unifying architecture and even less town planning. Municipal zoning regulations, not particularly strong anywhere in Argentina, have not keep pace with rapid growth since 1985. The original architecture is a “Queen Ann” influenced structure known as the Fuegian cottage. Constructed of lenga beech wood with steep peeked roof lines, it has intricate decorated window treatments and structural ornamentation. Unfortunately few original cottages survive. There are structures that are using elements of the Fuegian cottage, especially in the larger houses of the affluent further up the hillside and in some commercial buildings. Unfortunately Ushuaia is mostly a mixture of tourist kitsch, commercial nondescript, new hotels that sacrifice design for rentable square footage, and the brightly painted corrugated or concrete bungalows of the average working Ushuaian. The haphazard look is part of its appeal: boom-town meets the splendor of nature. On the waterfront's Avenida Maipu is the excellent Museo del Fin del Mundo which is well worth an afternoon - even if it’s not raining. Tierra del Fuego is a natural for adventure tourism. For panoramic views of Ushuaia and the Beagle Channel, the year-round ski lift on Cerro Martial is a short 4-mile walk, or taxi ride, from the center of town. The ski lift will transport you above the tree line to the dramtic beauty of the mountain and its glacier. It is possible to climb the mountain following well marked trails. Parque Nacional Tierra del Fuego not only has terrific hiking trails but protects one of Earth’s great biosperes in the southern hemisphere. Although 75% of the park's interior is off limits to all but scientists, the spectacular coastal zone open to visitors will convince the most jaded urban dweller to turn off their I-pod and allow the silence of awe inspiring water and mountain scenery to permeate the senses. 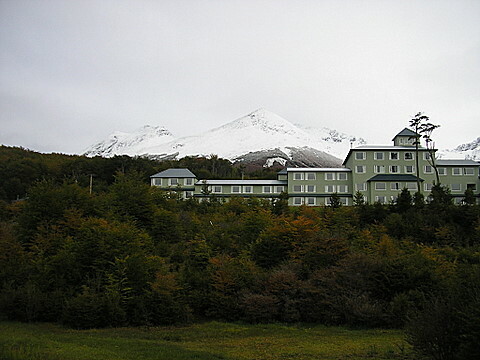 There are a great variety of accommodations in Ushuaia - large mountain-side hotels with panoramic views and prices in the several hundred dollar range, to modern hotels in town in the low hundreds, to many sizes of B & B’s and cabins in the US$40 - $60 range and backpackers hostels under US$10 per bunk. With a web search it’s easy to obtain information. I was fortunate to choose the Posada del Fin del Mundo that could not have been more perfect. Tierra del Fuego's seafood is prized throughout Argentina, Europe and North America. Succulent mussels the size of a human hand, an abundant supply of wild trout, hake, sea bass, oysters and Centolla - the aptly named "King Crab"! Ushuaia's restaurants, unfortunately, do not take advantage of the ocean's abundance as one would assume. I ate in four restaurants recommended by highly regarded guide books. Of those four I can recommend only one, Lomitos Martinica. Of the other three, I have reservations concerning Kaupe - considered Ushuaia’s best. Restaurant 137 Pizza & Pasta and Kuar are to be avoided. The best dining experience was missed by guide books entirely, Dulce Fuego.